Allied Component Works offers support to a local maker space in pursuit of FPGA technology. In the world of electronics for makers, the field programmable gate array (FPGA) tends to be a difficult subject to address due to a higher monetary investment and steeper learning curve than for typical maker solutions. The concepts involved and the tools and equipment that must be purchased and understood push the limits of college level engineering students and even challenge industry professionals. Now enter a maker space in Montgomery County, MD, aptly named MoCo Makers, to take on the task of changing this narrative around FPGAs for maker applications. Allied Component Works (ACW) is proud to support this educational initiative by subsidizing the design and manufacturing resources required to provide a robust product while maintaining an attractive entry-level price point for makers. The project is now the subject of a successful Kickstarter campaign with product deliveries to being in the summer of 2018. The resulting component product, named Fipsy for no reason other than a nod to certain historical inspiration, provides a simple FPGA on a small dual-in-line package (DIP) compatible with a modular breadboard. The FPGA, power decoupling, and even a test LED are provided on a small board with optional header pins. The FPGA selected is the simplest of the Lattice Mach XO2 series FPGAs. 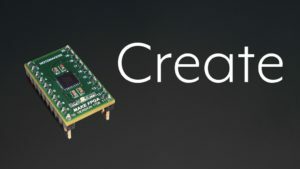 This FPGA was selected in the interest of the beginner for its low complexity and for the free and relatively straightforward tool chain available to support it. The FPGA also offers features familiar and useful to makers, including a single 3.3V power supply, built-in non-volatile configuration memory, an SPI programming interface, and a number of relevant fixed hardware resources. Programming the Fipsy through SPI is supported by open source software for the Raspberry Pi, the ACW BackHauler PMOD, and a growing base of user support for other popular maker platforms. MoCo Makers is actively supporting the product with user communication, a developing library of examples and experiences, and links to applicable maker-friendly educational materials. ACW will continue to provide manufacturing support and to serve in a technical advisory role while leaving the real work to the community organically evolving around the product. We all look forward to the continued success of our technology enthusiast customers and colleagues, student and professional alike!